‘Nother month, ‘nother glam bag! 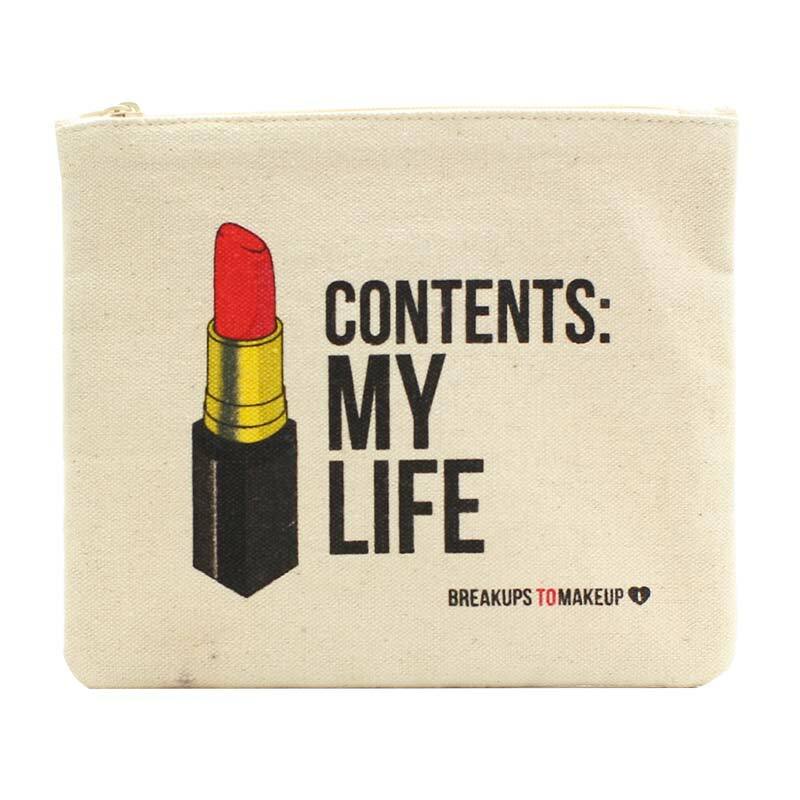 The bag: A deep canvas bag printed with Contents: My Life. That’s so not me. Haha I’ll probably regift this to one of my more beauty-devoted friends. Urban Decay Ultimate Ozone Lip Pencil + BONUS Revolution High-Color Lipgloss (sample – full size $16 + $22): The lip pencil is completely invisible, made of oils, paraffin, plasticizers and emollients. It’s meant to help lip gloss apply more smoothly and stay in place. It feels nice and really seems to do its job. It fills the lines in my lips a bit, which is great. I actually didn’t get to try the glosses (in Failbait, a bold mauvey pink, and Bittersweet, a deep purple) but Phyrra has some great swatches. For the money, I don’t think I’ll be buying this pencil, but it does feel nice. BellaPierre Waterproof Gel Eyeliner in Ebony (full size $15): My roommate and I both glanced at this and assumed it would be a liquid liner. In practice, it’s like a really creamy pencil. It’s fine, but another squandered opportunity to give me a grey, blue, white or green liner. I don’t think I’d spend $15 on this, simply because I can get the same product for less elsewhere. Bare Republic SPF 30 Mineral Face Sunscreen Lotion (sample – full size $15): Always glad to see sunscreens, but always shrugging at the formula. These always feel sticky to me, but it’s a necessary evil. I feel like this is on the expensive side. Luxie Beauty Rose Gold Tapered Blending Brush (full size $12): This is very soft. The bristles are synthetic. Overall, this brush has a nice feel and I believe it will last decently well. The description says it’s coated in antibacterial… something. That’s always somewhat concerning to me, as they don’t have to list what that is or how it works. But in general, this is nice, even if it’s not revolutionary. Klorane Smoothing and Relaxing Patches (two sample packets – full size $21 for 7 packets): I’ve gotten these before–or did you send them to me, KRo? Either way, I really liked these, so I was happy to get them. I feel like the full size is just a bit too pricey for what you get, but they are completely refreshing and my under eye area feels cool, soft and fuller all day long. Cornflower, who knew?